Travelled through the center of the city on my way to a meeting today and passed by this mural… It's part of a series of murals all over the city by various artists. This one is painted by a very talented street artist named David Walker - he specializes in faces and his work is truly amazing. Every time I pass by this mural I'm amazed how lifelike these eyes are … it's an awesome painting. 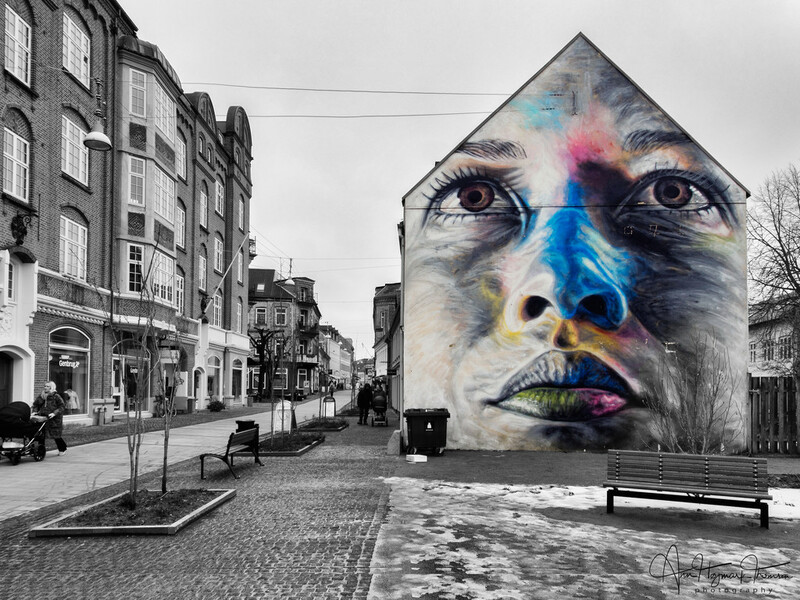 lovely to look at ,sorry to say I haven't heard of david walker but he is talented. VERY COOL, Ann. I just did a black and white with bits of color post too. We were thinking the same way from across the oceans. I just happened upon your image after I posted mine. Wonderful - the mural and your shot. Really like how you have used selective coloring for this image. So well done! Thanks for the link - nice to see it with color as well. I like yours better! Wow! I love the art work, great POV! Stunning - both the painting and your photo. Awesome capture and processing, Ann.